Your vehicle’s body may have experienced an unfortunate impact. Whether it’s your fault or not, you may not want to file a claim or use your insurance. Safety and repair cost are our customers biggest concerns. Scottsbluff Body & Paint takes care of both safety and money with our paintless dent repairs. Often, a major dent removal will require a new paint job, but our qualified techs will save you more with our paintless dent repairs. 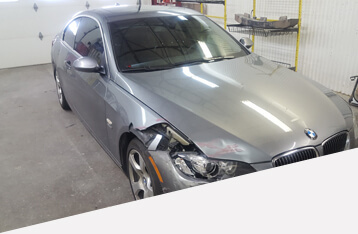 Another auto body repair facility can quote you for dent removal, but will also charge you for paint services afterward. The Scottsbluff team is highly-skilled and experienced at providing the services that save you time and money. We can make your vehicle’s dent disappear without a trace. Not only that, we can erase any evidence of the impact. Without proper body repair services, a dent removal spot can be obvious because of the affected paint area. Our technicians can make dent removal a quick, clean, and inexpensive process. We use all of the latest tools and equipment to perform your small and large paintless dent repairs. The process involves a special light to identify the dent’s size and circumference. This allows us to use special tools to massage the metal until the dent is flattened. Paintless dent repairs allow you to return your vehicle’s body to its original condition without the expense of panel replacements or paint jobs. These dings can come very easily and unexpectedly whenever you’re parked in public. We don’t want drivers dealing with any ugly and unnecessary dents and blemishes. Vehicles can also suffer from a hit-and-run accident that leaves behind a minor or major dent. Our affordable and complete services make us the best option in this area to meet your paintless dent repair needs. That unsightly dent has been bothering you for a while. Either it’s too big to feel like it can fixed easily, or you think it’s too small warrant auto body service. It all qualifies for the exceptional paintless dent repairs from Scottsbluff Body & Paint. Give our team a call at 308-632-0839 to schedule your next paintless dent repair. We keep your service experience convenient with an online scheduling system. You can pick the day and time that works best for you and we’ll meet you here! If you’re ever in our area with questions, concerns, or auto body repair needs, feel free to stop on by! We look forward to meeting any of your auto body repair needs, and we gladly accept walk-ins!